Schubert’s first introduction to music making was the violin, and he received lessons from his father at the age of eight. He would join the family string quartet as a violist some six years later, giving him access to product testers for compositions requiring any combination of string players, including those for violin and piano. Still, the works Schubert composed for his first instrument and piano remain in the shadow of his more celebrated repertoire for solo piano; they are hopefully brought into the light here. Hearing the Sonata in A Major, D. 574, the listener can imagine a serene, confident Franz Schubert (1797–1828), who, following a year of sonata-form exploration around 1816, would compose the A Major while gaining his methodological mastery and early musical maturity. Subtitled “Duo,” the designation aptly captures the carefree parity that occurs between piano and violin from the opening bars of the Sonata’s Allegro moderato. In the space of a few minutes, the duo’s discourse goes from chatty to operatic—but the drama seems to result more from two friends excitedly contributing forgotten points to the same tale than from any quarrel. The Scherzo finds violin and piano feeling their way with light foreboding through Schubert’s twists, turns and modulations, most often delivered with a wink. The Andantino asks the Sonata would it please behave and have some dignity, making a modest and proper theme, but ultimately relents, taking some light-hearted detours of its own. The final Allegro vivace returns to the mood of the earlier Scherzo, sending the duo through more modulated adventures until they at last arrive home, safe and sound. Written circa 1826 near the end of Schubert’s life, the “Rondo brillant” (Rondo in B minor, D. 895) is given an Andante introduction that leads to a weightier Allegro. This first brief movement is infused with a courtly elegance and contains many of the ideas expanded in the second, whose myriad sub-sections flow delightfully together as an inexorable build toward an exhilarating coda. The work was originally written for a Czech violinist named Josef Slavik, and perhaps its ruddy style, atypical of Schubert, was employed expressly for this fiery virtuoso. Also written for Slavik, Schubert’s Fantasie in C Major, D. 934, is truly ahead of its time for the way its movements are so effectively linked, even fused, together. While such a characteristic would become more familiar in the late Romantic period, it was all too mad for one music critic who attended the premiere in 1828—and was compelled to flee the Viennese concert hall before the work’s conclusion. The opening Andante moderato gives the pianist the role of orchestra in support of the violinist’s dipping arcs. With the Fantasie form permitting greater freedom than that of the Sonata, Schubert leads into a set of variations based on one of his popular songs, “Sei Mir Gegrüsst,” before finally returning to the striking opening theme. Schubert’s three Sonatinas (D. 384, D. 385, & D. 408), written when the composer was only 19, were originally titled Sonatas (per Schubert’s autographs), but were given the diminutive title by Schubert’s Viennese publisher, Anton Diabelli, perhaps in an effort to market toward the amateur market. The works by any name are polished and smooth, revealing Mozart as their prime influence. 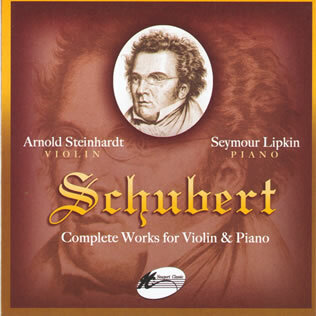 While the pieces are certainly transparent and unassuming, they are by no means insignificant, as they possess Schubert’s consummate strength of craft, felt even in these early works, to say nothing of his genius, which seems to appear around every corner in these works—most often unannounced.